Just imagine strolling down the urban hills of San Francisco and seeing an adorably authentic pirate store that draws you in and then realizing that it is not just a store but an oasis for young writers. At 826 Valencia that image is made reality by the nonprofit organization for young writers 826 Valencia aka The Pirate Store. It all started when educator Ninive Calegari and author Dave Eggers came together and decided they wanted to create a place to help overburdened teachers and reach out to the students who needed their help the most. As it turned out though, the place they choose was zoned for retail purposes only and so they decided to open up a pirate store in order to meet city requirements. Hidden behind the store however is where the true tales of 826 Valencia are written. Staying true to their dream of creating a place where young writers will feel free to ask for help and express themselves, Calegari and Eggers designed a comfortable “writing lab” filled with books, writing tables, and even a cozy reading tent. Today, with the help of more than 1,700 volunteers, 826 Valencia serves 6,000+ young writers (ages 6 to 18) per year by providing an abundance of programs and tutoring to every student that walks through the door. The organization also offers a wide variety of writing workshops where teens are invited to come together and learn everything from poetry translation techniques to storytelling and even comic book creation. The best part about these programs is that they are all free. It’s that kind of community impact that has lead the organization to earn a variety of grants and awards including the Library of Congress American Literacy Award, and most recently a $100,000 grant from the Yelp Foundation. 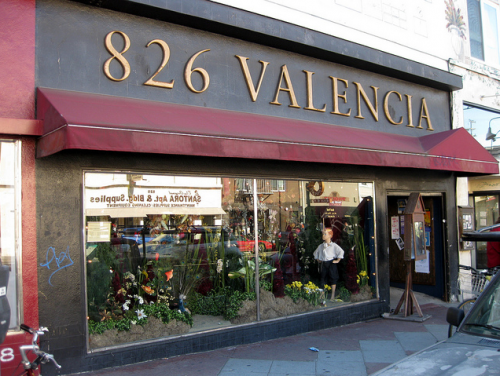 For those of you who live in the Bay Area and are interested in getting involved with 826 Valencia you can visit them online to learn more about their programs and hours. You can also tour the store and hang out with LTC’s Laura Michelle Thomas who will be dropping by the store on Saturday, December 21 at 3 pm to talk like a pirate about writing and publishing.